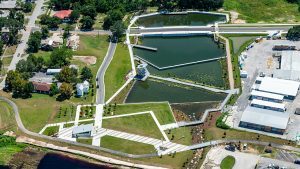 The Victory Pointe Stormwater Park in the city of Clermont is one of dozens of cost-share projects in which local governments have partnered with the St. Johns River Water Management District. PALATKA, Fla., April 9, 2019 ― Twenty-one projects in 10 counties will share in nearly $16.2 million for construction of water supply and water conservation, water quality improvement and flood protection projects. 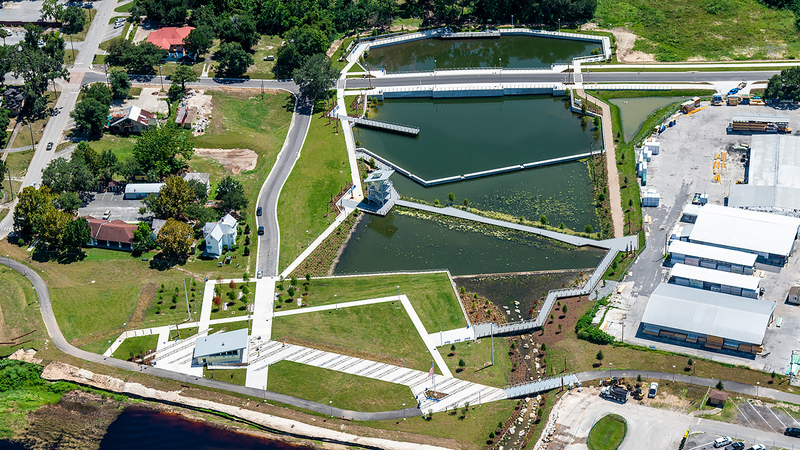 The St. Johns River Water Management District Governing Board on Tuesday approved the project ranking for the fiscal year 2019–2020 Annual Districtwide Cost-share Program. District cost-share funding for water resource protection and restoration projects helps local governments make progress in preserving, restoring and enhancing the Floridan aquifer system, the St. Johns River, Indian River Lagoon and other waterways and Outstanding Florida Springs. Nineteen projects comply with the goals of Gov. Ron DeSantis’s Executive Order 19-12 promoting environmental protection, including addressing algal blooms and nutrient reduction, investing in green infrastructure and developing alternative water supply sources. Wastewater treatment improvements and/or expansion in Volusia, Clay, Marion and St. Johns counties. Septic-to-sewer conversion in the city of Longwood and Brevard and Indian River counties. Muck removal in Cocoa Beach. Clay County Utility Authority’s reclaimed water storage and expanded distribution project, which will deliver reclaimed water to more than 2,000 new customers. JEA’s low-income toilet exchange conservation program. Two flood protection projects in St. Augustine and Jacksonville are estimated to protect 56 acres. The approved list includes seven springs restoration projects benefitting Outstanding Florida Springs, including Silver, Volusia Blue and Wekiwa–Rock springs. Projects are located in Brevard, Clay, Duval, Indian River, Lake, Marion, Putnam, Seminole, St. Johns and Volusia counties. Forty-eight applications totaling $31.6 million in requested district funding were ranked and scored based on core mission benefits, cost effectiveness, likelihood of successful and timely completion, and application quality and completeness. Extra points were awarded if an applicant provided evidence of an ordinance adopting the district’s water conservation rule. Projects must begin during fiscal year 2019-2020 and be completed within two years. The board also approved a list of 15 projects that provide water quantity and/or water quality improvements to Outstanding Florida Springs within the district, including Volusia Blue, Silver and Wekiwa–Rock springs. These springs protection projects will be sent to the Florida Department of Environmental Protection (FDEP) and the Florida Legislature for funding consideration. Between 2014 and 2019, more than 160 district cost-share projects have reduced total nitrogen entering Florida’s springs by more than 1 million pounds per year and have provided over 70 mgd of alternative water supplies. During this same time, cost-share programs have provided approximately $89 million in funding for springs restoration projects.